The Best Cheap Camera In The Market. 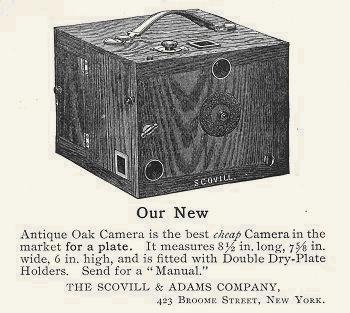 One of the most beautiful of all pre-1900 box form cameras is the Antique Oak Detective made by the Scovill & Adams Company. The camera is constructured of oak woods, instead of more traditional mahogany or cherry, finished in a light golden oak color. It was an inexpensive 4x5 inch plate camera offered to youths and "those who want to make a moderate investment in photography applicances." It was also advertised as "certainly lighter and more compact than any other cheap detective camera in the market." By 1895, a more expensive No. 2 camera was offered with a leather covering for $12. In the same reference, the original exposed wood model became the No.1 Antique Oak for $10. 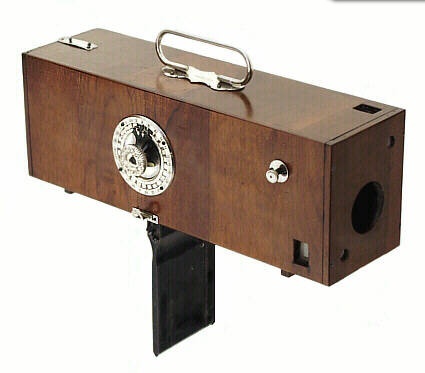 The Antique Oak Detective camera was later succeeded by the Knack Detective. Scovill & Adams Company. NY. 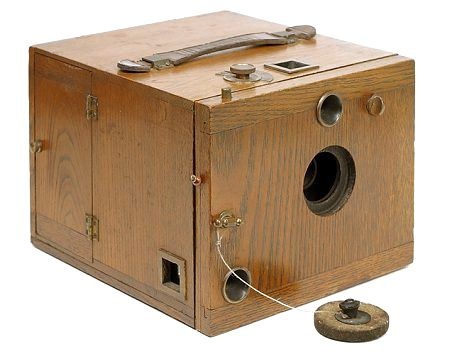 A simple string-set rotary shutter was hidden inside the wood front. The shutter was not "self-capping" when cocked for use. 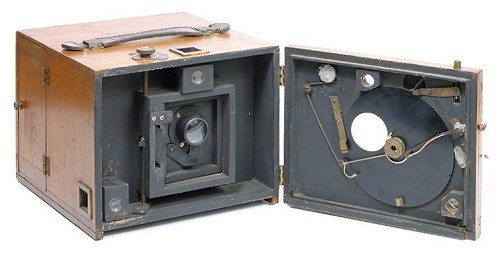 To prevent the glass plate from being exposed, the camera was sold with a felt plug. Focusing was accomplished by turning a brass knob located on the top of the body. The Scovill Antique Oak Detective has a beautiful would finish. It was the less expensive than the leather covered version. The Best Cheap Camera proclaimed the first advert for the Antique Oak Detective camera (1892). Front opened showing the simple string-set shutter.